This topic describes how to use Open Computing Language (OpenCL) to create an image, and then download it to an FPGA chip in an f3 instance. All the operations described in this topic must be performed by one account in the same region. We recommend that you use an f3 instance as a RAM user. You must create a role for the RAM user and grant the role temporary permissions to access the specified OSS buckets. Only the image we share with you can be used on an f3 instance. Select Assign public IP when creating an instance, so that the instance can access the Internet. The security group of the f3 instance has added the rule for allowing access to the SSH port 22. Log on to the ECS console and obtain the instance ID of your f3 instance. Create an OSS bucket in the same region as your f3 instance by using the same account. For more information, see Sign up for OSS and Create a bucket. Create a RAM user and grant permissions. Create a RAM role and grant permissions. Obtain the AccessKey ID and AccessKey Secret. To create an image and download it to an FPGA chip on an f3 instance by using OpenCL, follow these steps. Connect to the f3 instance. Note The subsequent compilation process may take a few hours. We recommend that you log on through screen or nohub, so as to avoid forced logout due to an SSH timeout. Run the command to install Screen. Run the command to enter Screen. Run the command to set up the environment. Configuring the environment involves installing the xocl driver, setting the vivado environment variable, checking the vivado license, detecting the aliyun-f3 sdaccel platform, configuring 2018.2 runtime, and detecting the faascmd version. If you want to run an emulation of sdaccel, do not run the above command to configure the environment. Instead, you only need to configure the environment variable for vivado separately. We recommend that you use Makefile for emulation. Run the command cat sdaccel.mk | grep "XDEVICE=" to view the value of XDEVICE. Make sure its configuration is XDEVICE=xilinx_aliyun-f3_dynamic_5_0. Follow these steps to modify the common.mk file. Run the vim ../common/common.mk command to open the file. Note Given that you must submit a DCP file to the compilation server, you need to add the parameter --xp param:compiler.acceleratorBinaryContent=dcp, so that Xilinx® OpenCL™ Compiler (xocc) generates a DCP file (instead of a bit file) after the placement and routing is complete. Run the command to compile the program. If the following information is displayed, the compilation of the binary file has started. This process may take several hours. Note The git branch must be the 2018.2 version. Run the cd getting_started/kernel_to_gmem/kernel_global_bandwidth/ command to enter the directory. Follow these steps to modify the Makefile file. Run the vim Makefile command to open the file. Run the command to check whether the packaging script exists or not. If the returned message contains cannot open (No such file or directory), the file does not exist. You need to download the script by running the following command. Run the command to set up the OSS environment. Run the ls command to obtain the file suffixed by .xclbin. Run the command to package the binary file. After the packaging is completed, you can find a package file in the same directory, as shown in the following figure. You can use a scripted process or step-by-step process to upload the package file and download the FPGA image. Scripted process: Only applicable to f3 instances with one FPGA chip. Run the following commands to upload the package and generate the image file. 0 indicates the first FPGA of the f3 instance. For single-FPGA instances, the FPGA serial No. is always 0. For instances with multiple FPGAs, such as an instance with four FPGAs, the serial No. are 0, 1, 2 and 3. Step-by-step process: Use the faascmd tool to perform operations. Run the command to upload the package to your OSS bucket. Then, upload gbs in your OSS bucket to the OSS bucket in the FaaS administrative unit. Run the command to view if the FPGA image is downloadable. If the returned message shows State: compiling, the FPGA image is being compiled. If the returned message shows State: success, the FPGA image is ready for downloading. Find FpgaImageUUID and note it down. Run the following command. In the returned message, find and note down FpgaUUID. Run the command to download the FPGA image. Run the command to view if the image is downloaded successfully. Below is an example of the returned message. 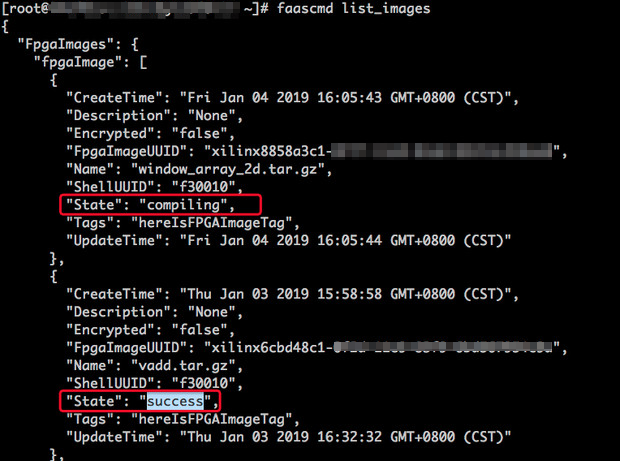 If the FpgaImageUUID in the message is the same as the FpgaImageUUID you note down and the message shows "TaskStatus":"valid", the image is downloaded successfully. Run the following command to configure the environment. In the directory where the Host binary file is located, run the vim sdaccel.ini command to create the sdaccel.ini file and enter the following content. If Test Passed is returned, the test is successful. This section introduces some common commands for f3 instances. During emulation, follow the Xilinx emulation process. You do not need to set up the f3_env_setup environment. The SDAccel runtime and SDAccel development platform are available in the official f3 images provided by Alibaba Cloud. You can also download them at SDAccel runtime and SDAccel development platform.